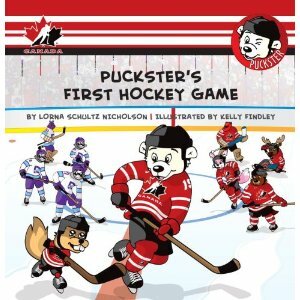 Noted children's hockey author Lorna Schultz-Nicholson has teamed up with Hockey Canada and illustrator Kelly Findlay to bring us a whole new hockey book franchise: Puckster! There are hundreds of thousands of young children enrolled in organized hockey associations all across Canada and nothing is more exciting for these kids than getting that first hockey sweater and playing in their first hockey game. With loads of exciting hockey action, great illustrations, and an entertaining story, young hockey fans everywhere will love to read—or be read— Puckster’s hockey adventures again and again. Each book is 24 pages long and published by Fenn. Lorna Schultz Nicholson grew up in St. Catharines, Ontario. She was a co-host and script writer for an aerobic television show. Moving to Ottawa, she was a reporter for a news show, and a researcher for a sports show, Donohue’s Legends, at CJOH television. Later, she hosted, produced, and wrote all the material for her own syndicated radio show in Ottawa, titled Family Time. By this time she’d had three beautiful children and she moved her family to Calgary, Alberta. There, she did a brief stint at writing magazine articles and a sports column, and a community events reporter for a local radio station.